The girls were very busy this week completing Art & Craftwork for a very special man in their lives... Dad!! Some of the girls from Ms.Delany's 6th class made some Wise Old Owls! Ms.Farrell's 5th class made cool collage ice-cream cards in the style of Eric Carle. Ms.Reilly & Ms.Flynn's Junior Infants made 'Best Dad I ever Saw' using paper plates, while Ms.Howard's Senior Infants wrote lots of nice things about their Dads. 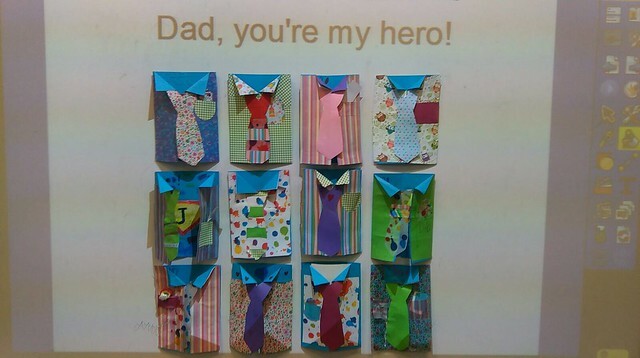 Ms.McKenna's 3rd class designed some fabulous 'Dad you're my hero' shirts and ties for their Dads!